Tuesday 17th March. The sun has just risen as Groupama 3 leaves her base in Lorient, Brittany. 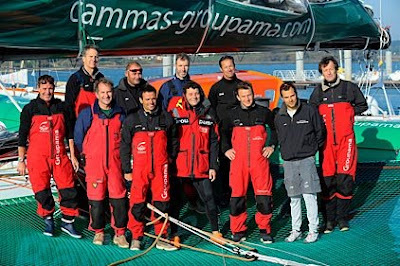 At the helm, Franck Cammas gives his orders to his ten crew with a mixture of precision and good humour. All eyes turn to the team back on land and Lorient's Cité de la Voile, which the maxi trimaran won't see again before the summer, after covering over 13,000 miles and performing two record attempts. For this initial Mediterranean campaign, Groupama 3 is heading for Istanbul in Turkey, where France's number one mutual insurance company goes by the name of "Basak Groupama". With a little less than 3,000 miles to the gateway to the Orient, it's a beautiful course which awaits the crew of Groupama 3: "We're going to be discovering some new navigation zones, particularly in the East of the Mediterranean with the Aegean Sea, the Ionian islands, the Dardanelles Strait and finally Istanbul. It's going to be an excellent training session for the crew and a good test for the new version Groupama 3 because the image we have of a calm Mediterranean Sea is often mistaken.